It time for another American holiday tradition in Albania. Easter! Albania’s population is about 80% Muslim so needless to say, most people here don’t know all too much about Easter. And while I’m not particularly religious, I do come from a Christian family…but mostly in the commercial-Hallmark-American sense. Aka holidays are more about gifts and candy than going to church. Regardless, when you live far from home you often find yourself clinging to strangely nostalgic traditions that you didn’t realize meant that much to you beforehand. Hence my weekend project of dyeing Easter eggs! 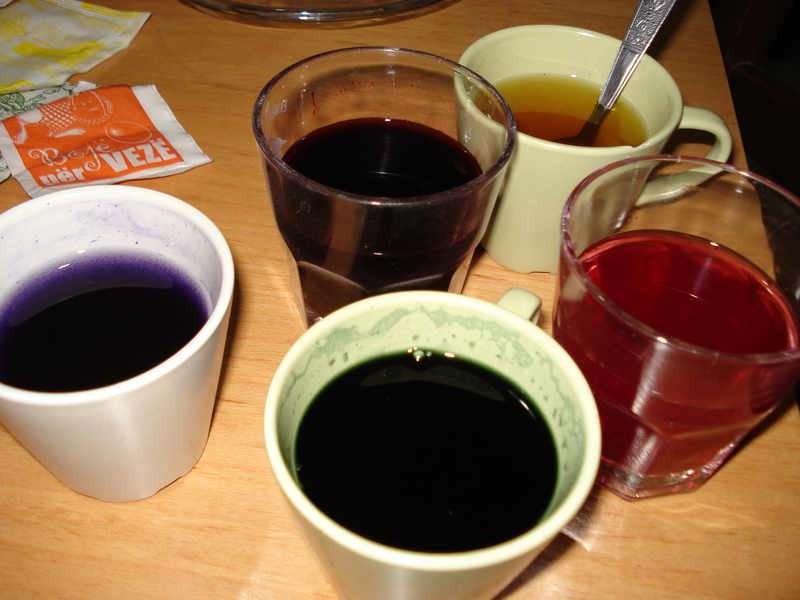 Luckily the 15% of the population that is Catholic or Orthodox in Albania does participate in this egg dyeing tradition, so it is possible to find egg dye in Albania. But it’s not like the PAAS egg dying packages with cute holders and stickers that we’re used to in America. 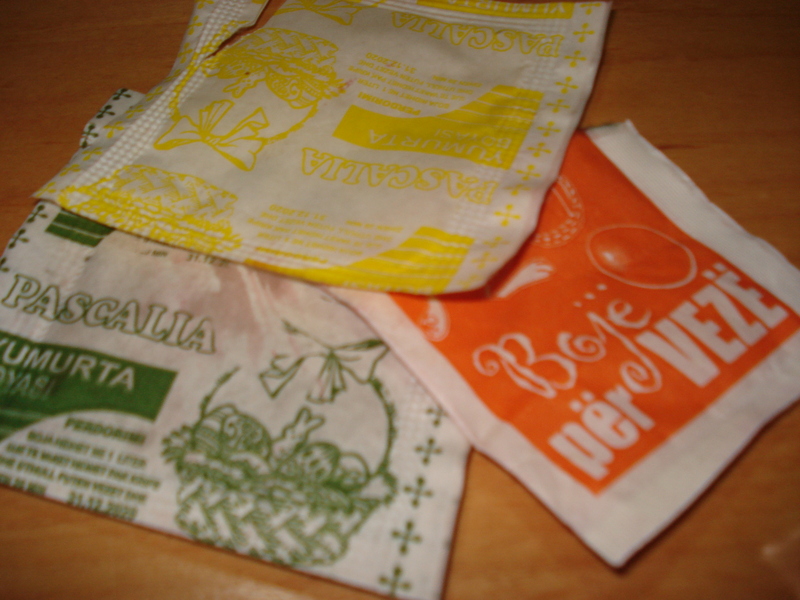 Instead you buy individual little packets for 20 cents each and pray that you’re Albania is good enough to translate the directions on the back. Like everything else I’ve found here, it looks good on the outside (which always gets me excited) but never seems to work all that well when you get down to it (which leads to inevitable frustration and mild depression). But after some trial and error I realized I just needed to leave the eggs in the dye longer than I was used to. Cue my predictable analogy between America’s instant-gratification culture and Albania’s “avash, avash” culture where everything just takes a little longer than it needs to. But hey, at least it works! putting my espresso mugs to good use for the first time! 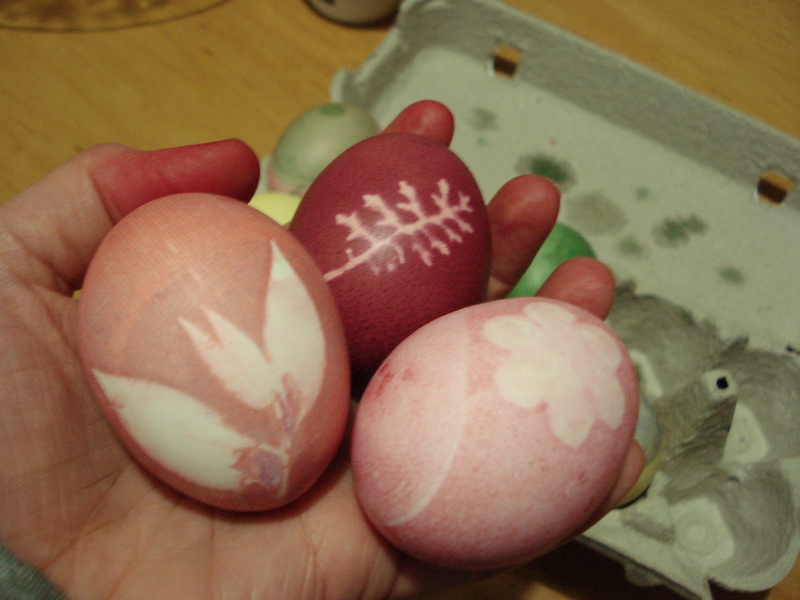 And I even tried some new ways of dyeing eggs that the lady at the store taught me. Step 1: pick fresh flowers or leaves from your garden. Step 2: place the plants onto the shell of the egg. Step 3: place it into a women’s stocking and wrap it tightly. Step 4: put the whole thing in the dye and wait for 5 mins. And you get these beautifully spring-like eggs! I’m a fan. Try to ignore my dyed fingers in this photo, they don’t have those nifty little metal egg holders here either! The best part about Easter in Albania is that all the Christians dye eggs then give them away as gifts (usually to all the Muslims, but there’s no hard feelings or insults or subliminal messaging I swear!). So now Easter egg hunts or anything like that. 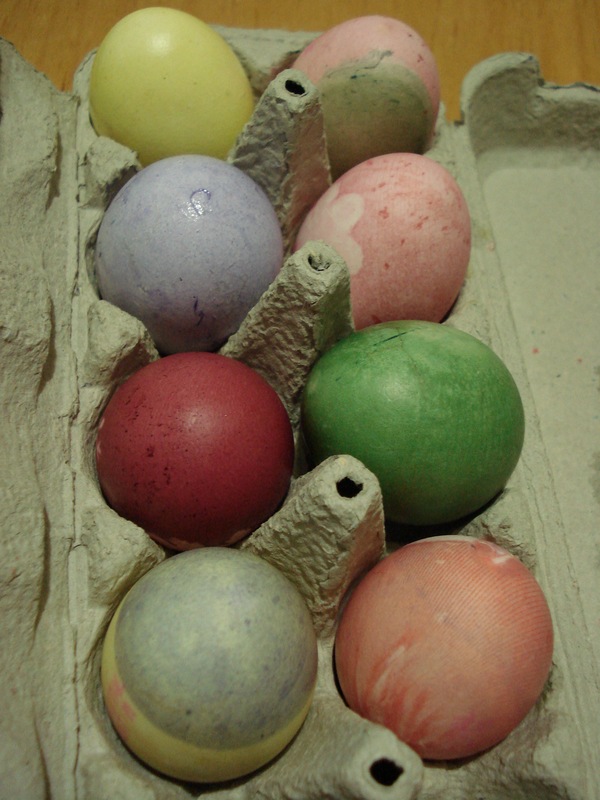 Instead, dyeing eggs is more of an art form and a way to celebrate the holidays between different religions. It’s actually pretty cool. All the Muslim teachers at school were so excited for Easter since they knew all the Christian teachers would be bringing baskets of beautifully dyed eggs for everyone. This is a tradition I might have to bring back to America (both to save me from high cholesterol and to spread the love! ).